The Eastern Daily Press, published daily in Norwich, is the largest-selling regional morning newspaper in the UK. 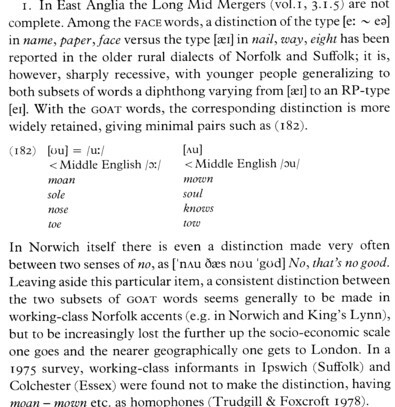 Peter Trudgill, the UK’s leading sociolinguist, comes from Norwich and is of course the author of The social differentiation of English in Norwich (CUP, 1974). 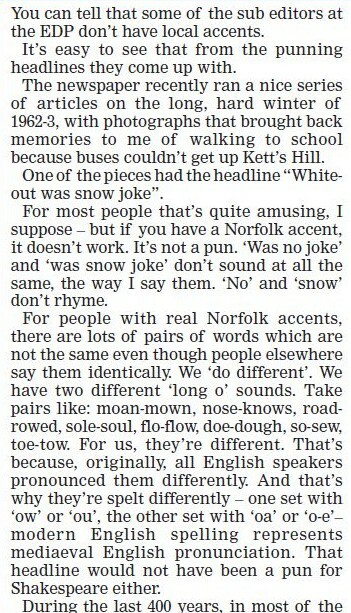 He is also President of Friends of Norfolk Dialect. From time to time he contributes articles on language to the EDP. Thanks to input from Peter, I was able to cover this point in my Accents of English (vol. 2, p. 337). He comments on the newspaper using puns that don't work in the local accent. On a similar note, I've commented here before on the expression all the gear and no idea — which, although not a pun as such, only really "works" because of the non-rhotic rhyme — so I was slightly surprised to see it used recently in The Scottish Hosteller magazine. Sadly, I rather suspect that it's unidirectional, and that non-RP puns won't be appearing in the London press any time soon. In my experience, lots of Scottish people exceptionally have non-etymological /r/ in idea, so this doesn't necessarily imply a non-rhotic rhyme. Couldn't it work when pronouncing an 'r' after "idea"? That seems to be common throughout the English speaking world, though I'm not sure whether that happens in Scotland. The Economist has made lots of puns with "yuan" = "one". It's a groanworthy distance from homophony in any accent, but somehat less so for Northern accents with the LOT vowel in "one". @Kilian Hekhuis: I've never heard an "intrusive R" after "idea" in North America. In Maine I have heard “idear”+V more than once. In rural ME a non-rhotic accent displaying intrusive r is still quite widespread though it definitely isn’t the prestige accent, and those who can often switch to rhoticity when talking to outsiders. In The Ragged Trousered Philanthropists, the dialogue constantly uses "idear". This was published in 1914 and the speech was based on that of rural southern England, which was rhotic at the time. It seems that this pronunciation has been around a while. @ vp: I'm sorry you haven't heard it, but it does happen. I've heard some rhotic speakers from Vermont who had /r/ at the end of that word in all positions (not just when the following word began with a vowel). It was just their normal pronunciation of that word, in other words. And, of course, non-rhotic speakers in the Northeast can have an R at the end of idea when the following word beings with a vowel. But this rule doesn't only apply to idea for them, of course. The late Eugene McCarthy, who was the Democratic presidential candidate in 1968, was from Minnesota, a very rhotic area, but he consistently talked of "new idears" in politics. But does adding an R to idea make the two words rhyme? For me, idea with an R would not rhyme with gear. But, then again, I'm not Scottish. Incidentally, are there any minimum pairs among the FACE words? Extrapolating a bit from the orthography in your examples, I'm wondering if the name set might including ate, then contrasting with eight. "Dane" vs "deign". See my book. The pair I usually use is "late" vs "eight", which then do or don't rhyme. This avoids the problem that most Brits rhyme "ate" with "let" rather than with "late", making ate/eight an unsuitable pair. Wikipedia has a list here (click on "show" next to "Homophonous pairs"). I'm not sure about all of these, and suspect that some or all may be "original research", but it's certainly a long list. Thanks, both. Curious list: it looks suspiciously computer-generated, and yet it misses out plane vs plain, which must surely be present in any input dictionary. Anyway, taking it at face value, I wonder if such speakers are immune from the common misspelling *baited breath. I use FACE, TRAIL, FREIGHT. As far as I know, there is no accent in which all three are distinct, and FREIGHT is a rather small lexical set. KIT, DRESS, TRAP, BAD, LOT, STRUT, FOOT, BATH, DANCE, CLOTH, NURSE, TERM, DIRT, FLEECE, BEAM, FACE, TRAIL, FREIGHT, PALM, THOUGHT, GOAT, SNOW, GOOSE, THREW, PRICE, CHOICE, MOUTH, NEAR, SQUARE, START, NORTH, FORCE, CURE. And my personal lexical set fingerprint: TRAP=BAD=BATH=DANCE, LOT=PALM, CLOTH=THOUGHT, NURSE=TERM=DIRT, FLEECE=BEAM, FACE=TRAIL=FREIGHT, GOAT=SNOW, GOOSE=THREW, NORTH=FORCE. I've checked in Shorrocks (1998), and the Bolton accent has [fe:s] for FACE, [trɛɪjəl] for TRAIL and [frɛɪt] for FREIGHT. I expect that this is true of much of Lancashire. If you think that no accent makes a three-way distinction, what is the reason for having the three lexical sets. On another point, which accents have FLEECE and BEAM distinct? I know that this was a feature of traditional northern accents, but it is now very rare. Are the sets still distinct in parts of Ireland? Wow... All of a sudden I feel like John Cowan and Steve Doerr didn't understand the idea of lexical sets. There was no need to add a plethora of weird words to the list because the Wellsian list is complete. What need is there for nurse, term and dirt when it is all the same vowel? A word in a Wellsian lexical set is a phoneme with a number of diaphonemic variations and the set is complete. That doesn't follow. For example, even just considering one accent that has A=B vs C and another that has A=C vs B, you need all three sets. 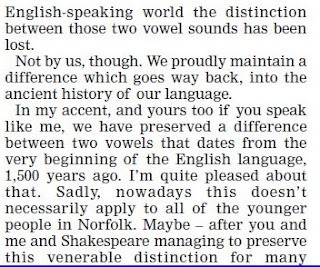 Ed: If you think that no accent makes a three-way distinction, what is the reason for having the three lexical sets. Are they really three distinct lexical sets? The diphthong breaking in TRAIL looks allophonic to me. Does [ɛɪjə] occur in other environments, or just before a dark lateral? What need is there for nurse, term and dirt when it is all the same vowel? A word in a Wellsian lexical set is a phoneme with a number of diaphonemic variations and the set is complete. In Scottish English, what is RP /ɜː/ in nurse, term and dirt is /ʌr~ɛr~ɪr/, so these three words do not all have the same vowel. Also, in January we had a discussion of the bawl~ball distinction made by some Americans. I must say that it doesn’t look as though John’s lexical set were complete, and it never pretended to be. "What need is there for nurse, term and dirt when it is all the same vowel?" If you're right, then Wikipedia needs correcting here and here, where it claims that fir/fur/fern aren't fully merged in some accents. I guess it doesn't give minimal pairs involving TERM, but if the spelling is anything to go by then I suppose that possibilities may include Sterling/Stirling or berth/birth, and kerb/curb or serf/surf. But ʌr is not a vowel. If what Karen says is true, then her ball is LOT and words spelt with ‹au› are THOUGH. J. M. R., what you claimed was that nurse, term and dirt all have the same vowel. However in Scottish English the vowels are /ʌ~ɛ~ɪ/. Thus not all the same. As to Karen: I gathered that she distinguishes bawl~ball~bowl and took it for granted that her vowel in bowl is the same phoneme as her vowel in though. Now if you say she also has though in bawl it can’t be true that she distinguishes bawl~ball~bowl... OMG! John Wells's lexical sets aim to cover only two accents: RP and his "GenAm". John Cowan's and Steve Doerr's aim to cover more accents (e.g. Scottish and Irish accents which split the NURSE set). Ed: TRAIL may not be an optimal choice: it is meant to be distinct from FACE in accents that don't have the long mid mergers. FREIGHT is all about Yorkshire varieties where /x/ was lost in freight, eight late, causing late not to rhyme with the first two. See WP's discussion of the fleece merger for FLEECE vs. BEAM. Steve: What is the difference between your THOUGHT, your MORE/MAW, and your FORCE=NORTH? But, again, ʌr is not a vowel. Scottish nurse STRUT, term is DRESS and dirt is KIT. 1. I never wrote that ʌr was a vowel, but explicitly stated that “the vowels are /ʌ~ɛ~ɪ/”. 2. I never mentioned John’s lexical set in connection with nurse, term and dirt, but only in reference to Karen’s bawl~ball distinction. 3. People who read what they comment on definitely have an advantage over those who don’t. @ Piotr Gasiorowski: You have guessed correctly: the /ɛɪjə/ occurs before a final lateral. I just mentioned it to contrast with the many accents in which TRAIL is monosyllabic. @ John Cowan: I see what you mean now. I suggest that "wait" might be a better keyword than "trail", as the latter involves L-vocalisation or pre-L breaking in some accents. Ed: "On another point, which accents have FLEECE and BEAM distinct? I know that this was a feature of traditional northern accents, but it is now very rare. Are the sets still distinct in parts of Ireland?" Yes, 'MEET' and 'MEAT' (as they are usually called) are still variably distinct for some speakers in (rural?) Ireland. Over the last 10 years, I have recorded some farmers in County Tyrone with levels of over 70% or even 80% FACE-like vowels in MEAT. Having grown up there, I also have this variable distinction, though in a reduced set of words and only in the most colloquial and local of contexts (e.g. beak, beat, cheap, decent, eat, heat, Jesus, meal (flour), meat, peace, seat, weak). The vowel is very like that of FACE, but is probably in near merger with it rather than identical to it (in some phonological environments at least). John Cowan: "I use FACE, TRAIL, FREIGHT. As far as I know, there is no accent in which all three are distinct, and FREIGHT is a rather small lexical set." Even ignoring Scots, there certainly were traditional dialects with this distinction in the mid-20th century, although how much that is still the case is another matter. So traditionally in Northumberland, mate was [mjɛt], bait was [be:t], and eight was [ɛit] (= PRICE vowel in SVLR short environments). In 2006, I recorded a speaker in north Northumberland with this system (variably of course). 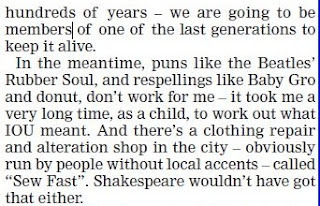 In Tyneside, as far as I can tell, mate=bait=eight, with some speakers still having [ɛi] variably in 'eight' words, and with [jɛ] lexicalised in a few items for some speakers (e.g. 'chebble' for 'table'; compare '(h)yem' for 'home', also from northern Middle English /a:/). MORE/MAW is an open vowel. The others are closer, and very similar to each other, but subtly different depending on the presence of an <r> (despite the fact that my London-area accent is non-rhotic). Laud ≠ lord for me. MORE/MAW occurs in open syllables, but also in morphologically related words, e.g. torn has the open vowel of tore (or, at least, it did have in my teens when I remember having a lengthy discussion about the pronunciation of this word with a school mate, for whom it rhymed with lawn). @Steve Doerr: this sounds like the BOARD/BORED split. It's part of my native phonology, but I've consciously abandoned my BOARD allophone as a result of living in the US. @ Warren Maguire: That's some interesting information. Thanks for your post. I've just had a look at your website. Your NESPS sounds fascinating. I'd be interested to know what the sites are. @ Ed: The pilot looked at Hawick (what an amazing dialect!) and Westerhope, Newcastle. A wider atlas project is only in early planning stages I'm afraid (and, assuming those plans come together, would be dependent upon generous funding from one of the research councils). I hope that you get some funding for it. We'd all be interested to learn about these dialects. I don't know anything at all about Hawick. I wonder whether younger people in Norfolk are moving more towards what's sometimes called the GOAT-GOAL split. Peter says that many young people no longer use different vowels in "no" and "snow". 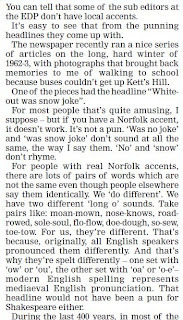 As I understand the Norfolk split, the same vowel would have traditionally been used in "goat" and "goal". It'd be interesting to know if this is still the case or whether they've moved towards the system mentioned in LPD amongst other works, with an allophone before /l/. 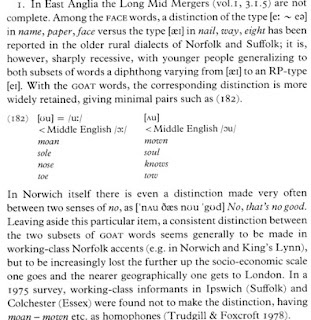 I've seen some text books say that traditional west Yorkshire dialects have a similar GOAT split to Norfolk, but the incidence is not the same. "Goat" and "goal" have had different vowels here for centuries (although this is not the case in the more eastern parts of Yorkshire).